This consultation seeks public input on the merits and key features of an online Administrative Monetary Penalty (AMP) system for infractions of provincial statutes and municipal by-laws, excluding very serious offences (including those that result in imprisonment). This input will help the ministry make decisions about a potential framework and key features for the system, and draft proposals for legislative change needed for its implementation. When an individual violates a provincial statute or municipal by-law, the current system treats it as an “offence” to be prosecuted under the Provincial Offences Act (POA). Last year in Ontario, roughly 1,650,000 Part I and Part III provincial offences charges were laid under provincial statutes and municipal by-laws. These charges are largely made up of traffic matters (e.g. driving without a license). Although provincial offences are not crimes, the process for fighting them in court often mirrors the criminal trial process, which is designed to emphasize the seriousness of an offence and to protect defendants from being unfairly punished. Like the criminal court process, the process for dealing with these matters requires significant court and law enforcement resources, which are paid for by Ontario and municipal taxpayers – resources that could be redirected to other needs. Approximately 1,650,000 Part I and Part III provincial offences charges were laid in Ontario last year. In contrast, between 500,000 and 600,000 criminal charges are laid annually. The complexity of the current system may also pose barriers to meaningful access to justice. Those who wish to dispute provincial offence charges may find that the cost, length of time involved, formality and inconvenience of the court process are significant deterrents to fighting a ticket. To help build a system that is effective, simpler, faster, less expensive – but still fair – for all Ontarians, the Ministry of the Attorney General (“the ministry”) is exploring whether to adopt an online administrative monetary penalty system (AMP) for select infractions of provincial statutes and municipal by-laws. The most serious provincial matters would continue to be prosecuted as offences in the Ontario Court of Justice. An online AMP system has the potential to be a more appropriate and accessible way to deal with certain matters under the Provincial Offences Act. It may also meet the public’s expectation of electronic access to modern public services. Administrative monetary penalties (AMPs) are a civil (rather than quasi-criminal) mechanism for enforcing compliance with regulatory requirements. They are an effective, quick, clear and tangible way for regulators to respond to infractions of the law. In practice, a monetary penalty is assessed and imposed in the form of a notice with a prescribed date and time for payment. While monetary penalties do not lead to convictions or pose a risk of imprisonment, administrative decisions may still be made (e.g. demerit points, driver license suspensions). Because AMPs are imposed without a court hearing, other protections are put in place (e.g. unbiased decision maker, right to be heard) to ensure that the process for imposing a penalty is fair and in accordance with the principles of natural justice. AMP systems have been upheld by the courts as appropriate for matters under provincial control. The resources required to enforce straightforward infractions of provincial statutes and municipal by-laws under the Provincial Offences Act are significant. An AMP system could provide a more proportionate, efficient means to ensure enforcement. Last year, POA matters used over 17 per cent of court time at the Ontario Court of Justice, even though only three per cent of tickets resulted in a full trial. While criminal matters are given priority over provincial offences in scheduling, a significant portion of justice of the peace time must be set aside for provincial and municipal disputes. In 2013, the City of Toronto was responsible for one quarter of all POA charges filed in the province. As a result of a high volume of charges, the city has budgeted over $50 million annually for POA courts in recent years. In 2014, the cost of having police officers appear in Toronto POA courts was over $5.5 million. (City of Toronto Court Services Division Service Efficiency Study, Sierra Systems 2012). In addition, most POA trials – even for minor traffic offences – require the in-person participation of a justice of the peace or judge, a prosecutor and the officer who laid the charge. POA trials are therefore often scheduled months in advance, extending the public’s wait times to resolve their cases and tying up valuable court resources that could be used for more serious, including criminal, matters. Justices of the peace and prosecutors also perform critical functions in the criminal justice system. Addressing the less complex, straightforward provincial and municipal matters, which are not criminal in nature, through a civil process would not only be more proportionate to the seriousness of the majority of these infractions, but would also allow the Ontario Court of Justice to focus its resources on the over 220,000 criminal cases heard before the court each year. Other key costs associated with POA trials include the attendance of enforcement officers as witnesses and courtroom facilities. An online AMP system would not require most of these resources and their associated costs. In its 2011 report, Modernizing the Provincial Offences Act, the Law Commission of Ontario conducted an in-depth review of the POA system. The review was to ensure the POA system was appropriate for Ontario’s current legal environment, and to determine whether a less expensive, but equally fair, forum for adjudicating provincial offences should be made available to the public. In developing the report, the Commission consulted with the judiciary and a wide range of stakeholders, including municipalities, court administrators, prosecutors, the criminal defence bar, police and ministry officials. The Commissions’ review of AMPs, and literature documenting their effectiveness and advantages as an enforcement tool, provided a compelling case for a gradual shift away from court-based processes. Aside from court and resource considerations, the Law Commission of Ontario suggested that a greater respect for the rule of law and administration of justice would be achieved if court and judicial resources were reserved for more serious matters. The Ministry of the Attorney General is committed to working with justice partners in new and more collaborative ways to make the province’s justice system simpler, faster and less expensive for all Ontarians. To achieve this goal, the ministry is leading a comprehensive plan to build Better Justice Together. This strategy seeks to improve access to justice for all Ontarians by implementing changes in thoughtful, evidence-based and innovative ways that uphold principles of justice and fairness while making the best use of resources. Ontariocourtdates.ca now provides information to the public and lawyers about cases being heard the next day in the Superior Court of Justice and the Ontario Court of Justice. Under a new pilot initiative, people or businesses can file small claims in Brampton, Oshawa, Ottawa and Richmond Hill online using an e-filing application. In the far North, the ministry is providing video solutions to connect First Nations people remotely with justice services. Exploring the creation of an online administrative monetary penalty system for infractions of provincial statutes and municipal by-laws directly aligns with the ministry’s vision. The provincial offences system is the part of the justice system that members of the public are most likely to use. Today, a significant number of people in the provincial offences courts are self-represented. An online AMP system for designated POA matters would provide an appropriate, efficient, accessible and fair process for challenging tickets, while decreasing costs to the public. The ministry is also interested in the views of the public and our justice partners about what kind of ticketable infractions could be captured within such a system. Given the many kinds of offences currently prosecuted under the POA, a phased approach to implementation will help us to properly assess the suitability of an online AMP process. For example, the majority of POA matters heard in court are traffic-related. Some of these matters, along with parking and minor by-law tickets, might therefore appropriately be among the first to be dealt with in an alternative online AMP system. Approximately 85 per cent of POA charges result from violations of the Highway Traffic Act (e.g. speeding, no vehicle permit) and Compulsory Automobile Insurance Act. The ministry recognizes that not all matters are suitable for an online administrative monetary penalty system. Very serious offences raising significant concerns about public safety and welfare, for example, would continue to be prosecuted as offences in the court system. This would include prosecutions under Christopher’s Law where the penalty includes imprisonment, or the most serious provincial matters resulting in death or serious harm. As mentioned earlier, such matters would continue to be prosecuted as offences in the Ontario Court of Justice. AMP systems are becoming widely accepted as the modern approach to regulation in Ontario, across Canada and around the world. There is a growing belief that using AMPs for straightforward infractions which are currently prosecuted as provincial offences more accurately reflects their regulatory nature, while also distinguishing them from criminal offences. In Ontario, AMPs exist for many non-criminal violations of the law, including violations of energy licences, environmental damages and unfair insurance practices, among others. They are also being applied to parking infractions in several municipalities, including Oshawa, Brampton, Mississauga, and Windsor. Ontario is not the only jurisdiction in Canada to explore the use of AMPs for some traffic matters. This is a relatively new concept taking shape in both British Columbia and Alberta. Like Ontario, both jurisdictions currently resolve traffic offences in provincial courts that are designed for prosecuting serious cases. Alberta, in particular, claims that this practice has become expensive, intimidating and confusing to taxpayers. Both jurisdictions are currently in the design and development phases of their projects. British Columbia passed legislation in 2012 to set up an AMP system, which has not yet been implemented. Alberta consulted on their traffic court reform in early 2014. A pilot project is underway in Red Deer that removes traffic violations from local courts and redirects the public to a designated venue where their matters are heard before an impartial adjudicator. Online technologies have the potential to promote both efficiency and meaningful access to justice. While an online system for resolving POA disputes does not yet exist in Canada, it would have a number of advantages. The current process for dealing with provincial and municipal infractions is primarily paper-based. Transitioning appropriate provincial and municipal matters to a user-friendly, online system could remove the barriers of complexity, formality and inconvenience experienced by some defendants. There is growing consensus globally about the need to integrate technology into the provision of public services, including justice services. Today, Ontarians are growing increasingly accustomed to using computer and mobile devices to access business and government services, such as online shopping, banking, or applying for a new driver’s licence or health card. We are also seeing an increasing number of jurisdictions utilizing online technologies for the resolution of civil disputes. British Columbia began testing the use of online dispute resolution (“ODR”) in 2011 for tenancy and consumer disputes. Since then, ODR models are being used by Consumer Protection BC and the Property Assessment Appeal Board with very promising results. BC is also finalizing the development and implementation of its Civil Resolution Tribunal, which it claims will rely heavily on modern information communication technologies, like ODR, to deliver its services. We can find examples of ODR being used globally in other areas including family law, housing or tenancy and employment. These examples demonstrate a shift towards alternative dispute resolution processes that are streamlined, user-focussed and complementary alternatives (or additions) to traditional court processes. The Law Commission noted that the provincial offences system is the “face of the justice system” for most Ontarians and that most defendants are unrepresented. The POA must, therefore, have “simple, easily understood and accessible procedures”. An online system could therefore provide a familiar and easy way for the public to access and efficiently resolve penalty disputes. It could also provide those wishing to challenge a penalty with important information about the dispute process, relevant legal considerations, including available defences and possible outcomes, and references to educational resources. Proportionality is an important consideration in exploring an online AMP system. Proportionality means that the public resources allocated to resolving a dispute are justified by, and do not exceed what would be appropriate for, the severity of that dispute. The most costly procedures should be reserved for the most serious disputes. This concept has been supported in civil law all the way up to the Supreme Court of Canada. There is, of course, always some tension between accessibility and the truth-seeking function, but as much as one would not expect a jury trial over a contested parking ticket, the procedures used to adjudicate civil disputes must fit the nature of the claim. If the process is disproportionate to the nature of the dispute and the interests involved, then it will not achieve a fair and just result. Even in criminal law proportionality is one of many valid goals. For example, some years ago the federal government “reclassified” a number of criminal offences so that a prosecutor can now decide whether a particular case needs the most costly of procedures, for example a jury trial, or could be heard following a simpler and faster process. Utilizing the same process for disputing some traffic, and other ticketable, matters that is required for prosecuting serious matters is disproportionate and unnecessary. Moving some POA matters from the courts to an administrative system would uphold the concept of proportionality while continuing to protect the public interest in using court resources where most appropriate. The ministry has not made any decisions about a possible future online AMP system for infractions of provincial statutes or municipal by-laws, or what infractions would move to an AMP system. Your advice and input will help inform decisions about if and how the ministry will proceed with the AMP system, and the key components that could be included. Determining the design elements of a delivery model, such as an online dispute resolution system, will require further consultation with technology and legal experts. These more detailed discussions will take place in future phases of this initiative. We would appreciate your input on any of these issues and on the questions below. See submissions below for details on how to submit your input to the ministry. Was it inconvenient to have to attend in person? Was your matter resolved quickly? Do you have concerns about the complexity of the process, significant lead times for trials, etc.? Please tell us about your experiences with AMP systems (generally) in Ontario and/or other jurisdictions. Were you satisfied with the process and outcome? Why or why not? If the on-line system provided supporting information and guidance through the dispute or payment process, would this enhance access to justice for self-represented litigants? What is the best way for people without internet access to receive services, attain information or dispute a matter, e.g. over the telephone? Would it be an advantage if the system was available 24-7? Matters that could result in jail time are not appropriate for AMPs. Are there others? If the first phase of the transition to an online AMP system was to focus on traffic infractions, what should be included? What should be excluded? Some Ontario municipalities employ screening and hearing officers to resolve parking infraction disputes. What training and expertise should be expected of a screening and/or hearing officer in a new online AMP system for infractions of other ticketable matters? In the coming years, the Ontario government will be focusing its energy on modernizing ministry and court processes and technologies to make our services more efficient, and to improve access to justice. Exploring an AMP system for POA infractions, and the online delivery of that system, is just one of the many approaches the ministry is considering. We encourage you to share your ideas for other approaches the ministry should consider to achieve its Better Justice Together goals. (For large organizations) What impact would a new AMP system have on your organization? What challenging implementation issues do you foresee? How might we address them? Please provide your submissions no later than April 14, 2015. Both electronic and hard copy submissions will be accepted. Electronic submissions may be sent by email to poa-amp.feedback@ontario.ca. Please use subject line: Administrative Monetary Penalty System for Provincial Offences. Please note that unless agreed otherwise by the Ministry of the Attorney General, all responses received from organizations in response to this consultation will be considered public information and may be used and disclosed by the ministry to assist in evaluating and revising the proposal. This may involve disclosing any response received to other interested parties. An individual who provides a response and who indicates an affiliation with an organization will be considered to have submitted the response on behalf of that organization. Responses received from individuals who do not indicate an affiliation with an organization will not be considered public information. Responses from individuals may be used and disclosed by the ministry to assist in evaluating and revising the proposal. Any personal information such as an individual's name and contact will be handled in accordance with the Freedom of Information and Protection of Privacy Act and will not be disclosed by the ministry except in accordance with that Act or as may otherwise be required by law. Canada’s constitution enables the federal government to make substantive criminal law. It also grants provinces with the power to impose punishments by fine, penalty or imprisonment for the purpose of enforcing otherwise valid provincial law. In Ontario, the Provincial Offences Act (POA) is the procedural code for prosecuting offences created by provincial statutes, regulations and municipal by-laws. This means that while charges are laid under the legislation that created the offences (e.g. speeding and many other traffic-related charges are laid under the Highway Traffic Act), the forms used and the procedures followed are set out in the POA. Part I: Minor ticketable offences with a maximum penalty of a $1,000 fine. There were 1,500,000 charges received in 2014. Part II: Parking tickets. About 4 million are issued each year. These matters take up a minimum amount of POA court time. Part III: Serious matters where defendants are required to appear before the court and the maximum penalty could be a significant fine and/or jail time. There were 145,000 charges received in 2014. Municipalities administer the courts where provincial offences trials are heard. Justices of the peace adjudicate most provincial offence trials. Some provincial offences trials – usually those pertaining to serious matters— are heard by judges. Depending on the type of charge, prosecutions are conducted by either municipal or provincial prosecutors, or by Crown counsel in the Ministry of the Attorney General. 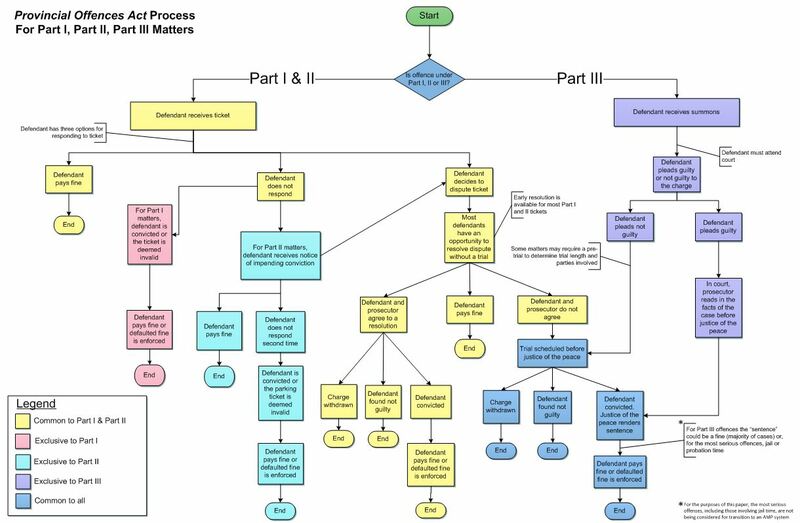 The following page provides a map of the Part I, Part II, and Part III processes for resolving disputes in the current POA model. For a complete written description of each process, please see the Provincial Offences Act Process Map-Text Version which is also posted on the ministry's website. If you require an alternative format to either the map or the written document, you may submit your request to the contact provided in the submissions section of this paper. Detail about how the system will operate, and specifically the elements of the online adjudication system, is beyond the scope of this consultation. The ministry plans to work with technological and subject-matter experts throughout the development process. The remainder of Ontario Court of Justice court time is comprised of criminal matters (74%) and family matters (9%).